People usually postpone their physical fitness campaign. It could be due to many reasons. Now you can promote your brand name by inspiring them for a better health. 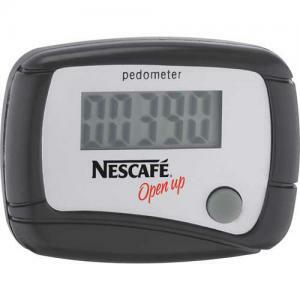 All you need to do is to gift them with custom in shape pedometer. 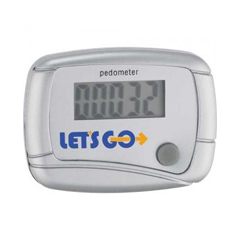 They will certainly love to start their work outs for a well trimmed body with your personalized in shape pedometer. It has an auto power off function with a belt clip for better attachment. 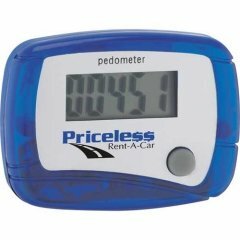 These pedometers will accompany your customers during their jogging or daily activities and display the records on an LCD screen. 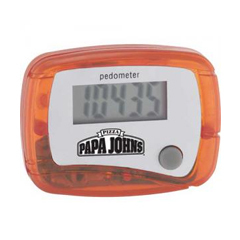 Thus your brand imprinted on the promotional in shape pedometer gets noticed by others in the Joggers Park or gym. Product & Design Quality -Works great! Customer Service & Shipping -There was a problem with the printing but they were super quick to resolve it! Product & Design Quality -We loved them and they were a popular item during our walk. Customer Service & Shipping -Gray was very helpful and the turn over time was great. Product & Design Quality -Super satisfied! Customer Service & Shipping -Excellent service and quick shipment. Product & Design Quality -Very good. Customer Service & Shipping -Shipping was quick and C/S was awesom! Product & Design Quality -Nice looking product, seems durable, and works well. Customer Service & Shipping -Order arrived timely and was complete.